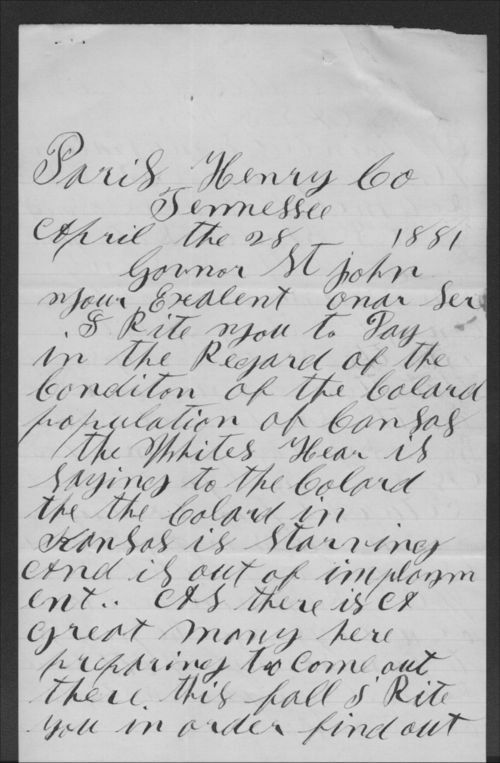 This brief letter was written by J. C. Black, a former slave from Paris, Tennessee. According to Black, his white neighbors were saying that black refugees in Kansas were starving and out of work. Black wanted to know if this was true before he moved to Kansas. He asked for a speedy response. In addition to his service as Governor, St. John also served on the Board of Directors of the Kansas Freedmen's Relief Association. This source's brevity makes it ideal for student use. It demonstrates the black perspective on emigration as well as white Southerners' efforts to discourage this emigration.